site where God descended to give Moses the Ten Commandments. Yet for centuries, mankind has not known its exact location. In this heart-pounding adventure, award-winning journalist and bestselling author Howard Blum tells the enthralling story of two modern-day adventurers - Larry Williams, a self-made millionaire and published author from Montana, and his friend Bob Cornuke, a retired policeman and former SWAT team member. 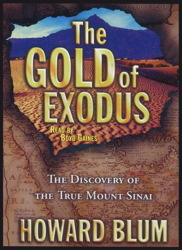 Lured by the prospect of finding a fortune in gold, the two men set out to find the true site of Mount Sinai - with the Old Testament as a guide. The stunning discoveries made at the mountain in Saudi Arabia known as Jabal al Lawz will astonish the world - and change the way we view it. What Williams and Cornuke found was compelling evidence of the stone altar at which the Golden Calf was worshipped, the twelve pillars that Moses ordered to be erected, and, most sensationally, the unnaturally scorched spot on the mountaintop where God gave Moses the two stone tablets. This action-packed tale - part high-tech treasure hunt, part modern-day spy thriller, and part biblical detective story - is riveting. And it is all true.